Harlow has a home! 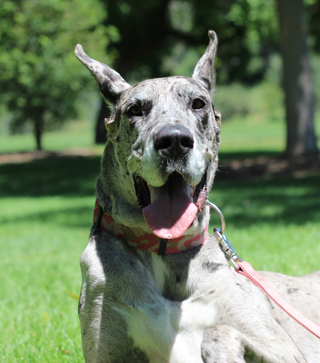 - Rocky Mountain Great Dane Rescue, Inc.
Miss Harlow has come a long way since coming into rescue and is now with Susan and her family. This sweet girl overcame some hurdles with being hit by a car and making it into our care so we could get her the surgery care she needed for her back hip. She has come leaps and bounds with her physical therapy. Susan and her family are signed up to continue the care that Harlow will require the rest of her life. Harlow is one lucky girl, as is Susan and her family.